Abstract: Objective To explore the effect of transforming growth factor β1 (TGF-β1) on immunologic function in rat model of sepsis. Methods The rat model of sepsis was established by cecal ligation and puncture (CLP) after intravenous injection of 20 ng/mL TGF-β1. ELISA was used to detect the serum contents of inflammatory cytokines including tumor necrosis factor α (TNF-α) and interleukin (IL) -6 and anti-inflammatory cytokines including IL-4 and IL-10. Western blotting was used to detect the protein expression of nuclear factor E2 related factor 2 (Nrf2) in the immune system organs. The effects of TGF-β1 on proliferation and apoptosis of human acute monocytic leukemia cell line THP-1 were determined in vitro. 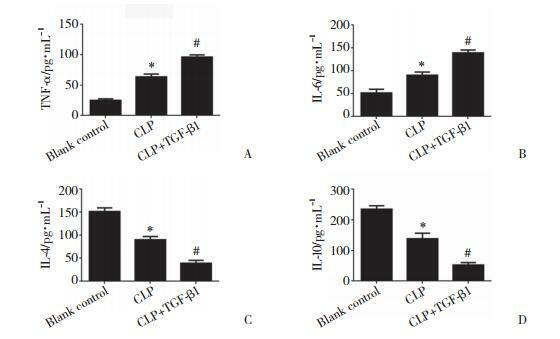 Results In CLP rats, the levels of inflammatory cytokines TNF-α and IL-6 in serum increased, and those of anti-inflammatory factors IL-4 and IL-10 decreased (P < 0.05). 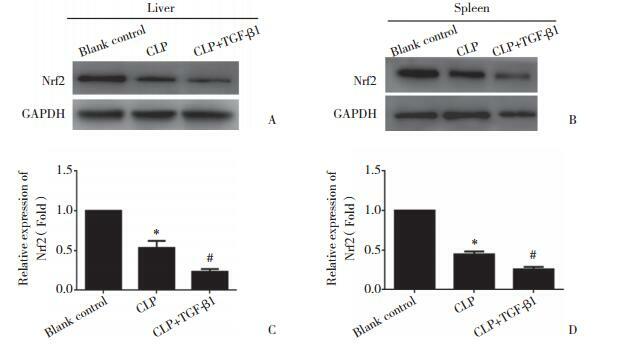 TGF-β1 also inhibited the expression of Nrf2 in the spleen and liver of CLP rats. 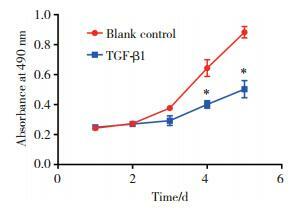 Moreover, TGF-β1 treatment in THP-1 cell line decreased proliferation and enhanced apoptosis compared with controls. Conclusion TGF-β1 is involved in the immunosuppression in sepsis rats, inhibiting the expression of Nrf2 in the immune system organs and inhibiting proliferation and promoting apoptosis of monocytes. CHAN JY, CHEUNG MC, MOI P, et al. Chromosomal localization of the human NF-E2 family of bZIP transcription factors by fluorescence in situ hybridization[J]. Hum Genet, 1995, 95(3): 265-269.